Sew what's cooking with Joan! : Happy St. Patrick's Day! A fun table complete's it!! Happy St. Patrick's Day! A fun table complete's it!! You don't have to spend a fortune for your centerpiece, just get creative! Green accents with white plates. 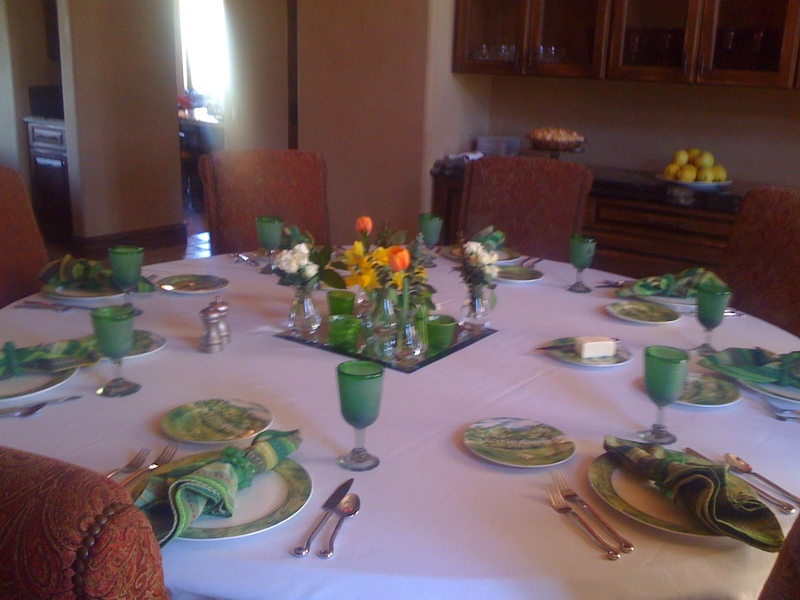 A square of green fabric in the center of the table. 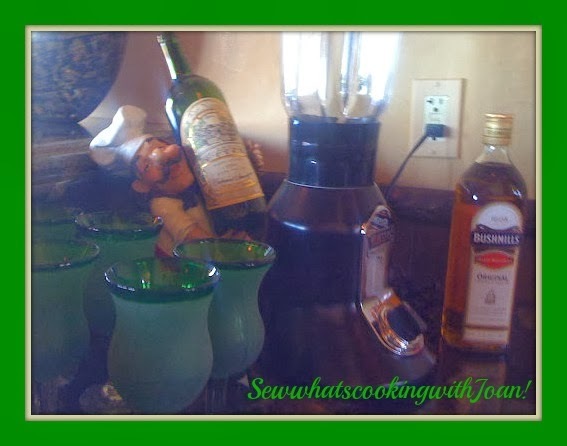 Some little green votive candles or holders or clear vases with some greens out of your yard. I was given these green golf plates a few years ago when we lived on a golf course, in San Jose Del Cabo. The green goblet's came from Guadalajara, when we were there buying furniture for that same house. On the side bar, you can see I bought lemons and put them on a plate for accent, that could be your center piece, inexpensive and usable after! You could tuck some greens into the spaces between the lemons, parsley or greens out of your yard. You also, can see a lemon meringue pie on the back bar, I will be posting that recipe around Easter!! It's a favorite!! * I squeeze 1/2 a lemon into a mug, first thing in the morning then pour about a 1/2 cup or more of hot water in. That enters my body first thing in the morning. I believe it helps to keep your body alkaline, which helps prevent disease. The bar is all set for Wee Bear's, Mom's famous, Whiskey Sour's! A shamrock plant would make a nice centerpiece for a smaller table or put it in the powder room to continue your theme. This can be bought right now at most supermarkets. My Irish Irish coffee caramel mousse, I made this to take to our Gourmet club dinner at Ruth and Jim's, tonight. I followed the recipe, but made smaller portions for 8 (recipe is for 6). I found that this portion is plenty, as it is so rich and yummy. I garnished with the caramel drizzle, then, sprinkled edible gold, to make it look like a pot of gold!! The little argyle truffle along side, is made by Julia Baker, a local maker here in Scottsdale. The coffee caramel mousse looks scrumptious! I'll have to try that tonight! Happy St. Patty's Day!!! Yes, it has just the right amount of coffee and Irish whiskey. I made it earlier this week, a half recipe for Wee Bear and I, it is yummy, but serving size large! So I made the recipe, but divided it for 8 yesterday, for our party tonight!! Have fun! Happy St. Pat's! We are off to golf with friends! Love the mousse with the argyle chocolate, great picture! No doubt it's as yummy as it looks. Today's blog was awesome...way to go! Thanks Amy! Ruth prepared a braised brisket, she deconstructed then, re-constructed it, to be wine friendly. The recipe was adapted from Anne Burrell. It was fantastic!! To accompany that she made a creamy sage polenta, adapted from Rachel Ray. To start she served a wonderful Potato, green Cabbage and Leek soup with creme Fraiche and mushroom chips ......ahhhh so, so good! And yes, the dessert was just the right amount and the flavor layers were mmmmmmmmm! Wee Bear loves MEAT BALLS! Spicey Long Beans with bacon! Quick and Easy Dijon Chicken! JJ's Easy Lemon Bars-What Can I Bring?? Let the Quilting Begin!! Double Irish Chain! Asparagus Leek soup for St. Patrick's Day! Juici or Tastee, that's the question? Some like it HOT! Jerk Chicken Spring rolls! Will the Real Jerk, please stand up!! First post from Jamaica Mon!